As a pioneer in online delivery, SOIS prides itself in ensuring our online programs meet the same high standards as our onsite programs. Regardless of location, you can be certain you will get a high-quality, research, service and student-centered degree that will prepare you to be a leader in the information profession. The School of Information Studies has a long history of providing quality online education. Both our online and onsite courses are taught by the same highly ranked faculty and instructors, and all faculty and online students are supported by the latest innovations in online instructional technologies to enhance the overall learning experience. SOIS is a member of the WISE Consortium. Extending our reach outside the traditional classroom to broaden the educational opportunities available to students. 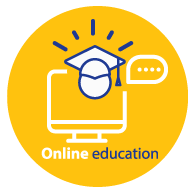 SOIS’s approach to online education involves user-friendly course software and convenient online delivery. The technical requirements are minimal. Most of the coursework is completed asynchronously so students can participate at their convenience. Real-time live chats and some “face-to-face” video meetings may be included, depending on the course. The program’s integrity is preserved with careful monitoring and pacing of students and material. A modern computer with at least an Intel core i3, i5, or i7 CPU, 4GB of RAM, and a 128GB hard drive is recommended. Note: UW-Milwaukee does not support the Linux, Chrome, Android or iOS. If you use these operating systems, you are responsible for your own support. A modern web browser updated within the past 1 year. Firefox or Chrome are recommended. Course software requirements will be outlined when necessary. Software will be provided on the SOIS physical and virtual labs, or made available for download. Unlike many other existing online programs, students pay only the online course fee rather than non-resident tuition regardless of location or residency. The total cost for degree completion is significantly less than would be accrued by having to relocate to complete a degree onsite. This fee is assessed for all on-line courses regardless of your geographic location. This fee is assessed in lieu of standard UW-System tuition and campus segregated fees. How is this fee determined? The University of Wisconsin System online course regulations determine how this fee is structured. This amount is calculated by adding the off-campus tuition for one credit to SOIS’ online fee. Over the past five years, SOIS has held the increase of this fee to under the percent applied to general tuition by the Board of Regents. (Resident and Nonresident tuition is determined by the UW-System Board of Regents, in the summer preceding each academic year. More information is available at the UW-System web site).